Christmas is only a few days away! Are you putting the finishing touches on your menu for the big day? I am! I am now down to deciding what drinks I will serve to my nearest and dearest at our gathering. This year I have uncovered 10 Family Friendly Drinks for Christmas that are perfect for serving at a gift exchange, a holiday meal, or just when friends stop by to wish your family well! 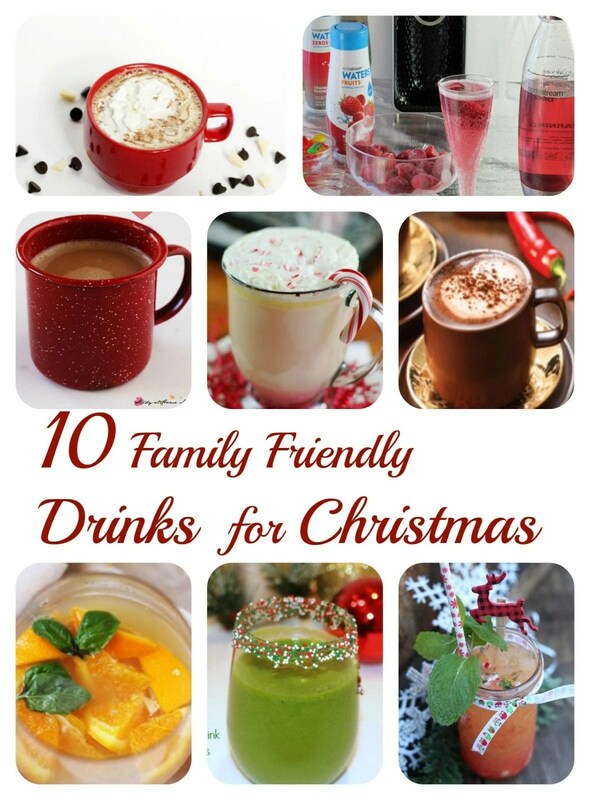 Which of these 10 Family Friendly Drinks for Christmas do you think you would most enjoy? I think I would love the Orange Mocktails! My family will adore the Black & White Hot Chocolate! If you have a favorite drink or mocktail recipe to serve for Christmas I would love to hear about it in a comment! The Peppermint Milkshake sounds like a nice treat for the holidays! My fave would be the Peppermint Milkshake because I love milkshakes and this one seems to be delicious.I am gonna try it soon. We tried the Black & White Hot Chocolate last night out by the fire it was delicious !! the grinch mocktail interests me because of the color and spinach is super good for you and i know this drink with the bananas and fruit mixed with the spinach would be delicious..
any ideas for friendly drinks for new years eve? Good question, we usually prepared a Shirley Temple for the the kids! I might look into it for next year. Thanks for commenting! Made the Peppermint Milkshake over the holiday but used chocolate ice cream and added some chocolate syrup. Combination was very tasty for a treat. The “Black & White Hot Chocolate” sounds decadent. Can’t go wrong with the ginger ale punches. I think I would like the Blitzen grapefruit mocktail. Blitzen grapefruit mocktail sounds so delicious!